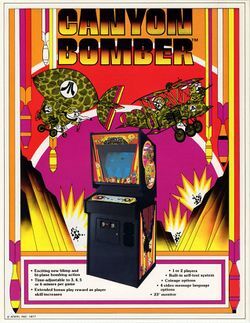 Canyon Bomber is an arcade game that was released by Atari in 1977; it utilizes a Motorola M6502 (running at 756 KHz), and the players must use a singular button, to make an always-moving airship (white for 1P, and black for 2P, but if there is only one player, the CPU will fill in for 2P), drop bombs into the canyon below to destroy numbered rocks for points. The numbers on the rocks range from 1 to 4, and reflect how difficult it will be for the players' bombs to reach them - and every time either of the player does not destroy any rocks, with his most recent bomb, his Miss Counter will decrease by one (the number it starts off at can be between 3 and 6, depending on how the cabinet is set). Once 150 rocks have been destroyed, as there are a total of 300 at the start of this game, the airships will transform into planes the next time they go off either side of the screen (and come back onto it from that same side); however, because the only game control is a single button, this does not affect the gameplay. Once either player's Miss Counter decreases down to 0, his game shall be over and the remaining player will continue without him - and once all 300 rocks have been destroyed, the game will immediately be over for both players regardless of how many misses they may have remaining. This page was last edited on 5 November 2014, at 17:30.